Granville Park Memorial in Aughton was in need of a clean up before the Remembrance Day services this Novemeber. 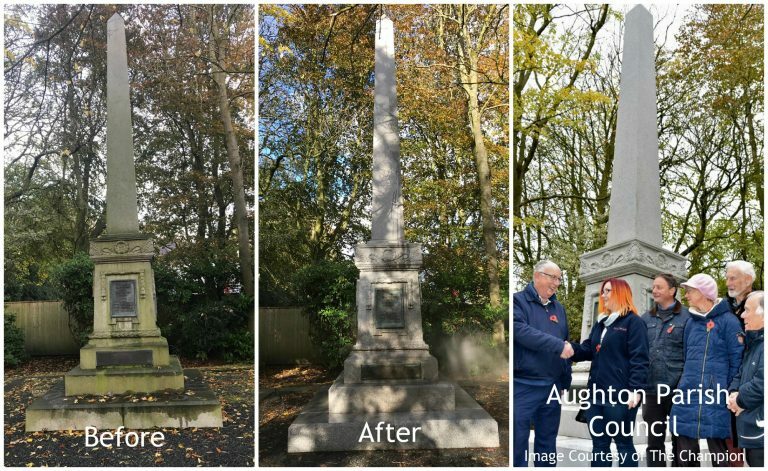 Specialist UK Restorations arranged to undertake these works free of charge for Aughton Parish Council. Aughton is local to both of the company directors at Specialist UK, so they felt this was a good opportunity to give back to the local community. The memorial is a Grade II listed structure so required specialist attention for any works. We used the Stonehealth Ltd DOFF system to undertake these works. This system avoids the need for the use of any harsh chemicals that may have effected the integrity of the stonework, but still leaves a crisp and clean finish.